Town and Villages to visit. Main towns: Capital Argostoli. Also Sami, Poros, Skala, Fiskardo and Lixouri. Many place names, local to island end – ata. Reputedly, one for every day of the year e.g. Kaligata, Peratata. Some villages of interest include – around\near to Argostoli: Dilinata, Davgata, Kourkoumelata, Faraklata, Lakithra, Peratata, Kourouklata, and Farsa. To the W – and the Pali Peninsula(Lixouri) visit Zola, Atheras, Agia Thekli, Kaminarata, Assos and Mesovounia. To the NE – Komitata, Neochori and Agia Efimia. Near to the nunnery of Agios Gerasimos see Valsamata, Troianata and Frangata. To the S – Keramies, Spartia, Karavados, Domata, Hionata, Markopoulo and Katelios. To the SE – Pastra, Tsanata, Agios Nikolaos, Tsakarisianos. Wherever you go look for and explore the deserted and ruined villages, following the 1953 earthquake, particularly Farsa, Frangata and Valsamata. Harder to find and reach are Tarkasata (near to Agia Efimia)and Vlahata Samis(near to Karavomilos). These villages are probably at their most atmospheric in the Spring and Autumn. They provide much interest particularly for botanists, artists, walkers and photographers. The young man 65 years old (only for joke) reccomends the following independent businesses on this page on the internet. Organize your excursions without any large commision. He (the young man) just wants to help tourist people to pay less for their holidays !!! Because if you pay less you will want to come again and this is good for you, for us, and for Greek tourism !I am not from Kefalonia but i love Kefalonia and i came here and open this business since 1976 . Geia mas !!! Also the young man advises the tourist people that renting a car is the best option for organizing your excursions by yourself. Using a car you can visit all the major places of interest and special sightseeings and beaches on Kefalonia Island. Renting a car gives you the freedom to start and stop as you like and also guarantees that you pay much cheaper prices. CLICK HERE to see some car hire companies and Oskar can help you to have the best prices because we do not take comissions we just care for the tourists. Reserve your accommodation, apartment, studio, villa, excursion, car hire etc. with independent local business. Prices are ranged 34% – 62% cheaper. No commission – no extra charge for you! Look for your own interest!! I just want to help tourists paying less money for their holidays! If you pay the real value for your holidays and any activities on kefalonia, it will be for less money, better quality and you will be even more satisfied. For more information the telephone for the bus station is: (0030) 26710 22281 – (0030) 26710 22276, or visit their office in Argostoli. Trips & Activities are guide in English. DISCOVER KEFALONIA = 27.00€. They also do the following excursions: Discover Ithaka, Explore West Kefalonia, Discover Zakinthos, Ithaka Cruise, Onassis Cruise, Myrtos Beach, Antisamos Beach. or visit their office in Argostoli. QUALITY & SERVICE, TOURS & DISCOVERIES are guide in English. They also do the following excursions: Southern comfort tour, Beach trip to Skala, Ithaka tour, Ithaka cruise, Tree island cruise, Zante cruise. For more information and prices the telephone for Panem Tours is: (0030) 26710 23526 – (0030) 26710 27045, or visit there office in Lassi. All these makes your holidays better and definitely you will come again, this is good for us and for the Greek tourism!!! Kefalonia Island is a fantastic destination and you know that! ANYONE WHO SAY LIES TO THE TOURISTS IS NOT A GOOD PERSON! THEY ARE NOT MORE CLEVER THAN EVERYONE ELSE! – COME TO OSKARS YOU WILL NOT REGRET IT! – OSKARS IS IN BUSINESS SINCE 1976 AND PROVIDES EXCELLENT FOOD AND SERVICE. – TOURISTS PLEASE COME TO SEE US AND CHECK EVERYTHING ABOUT OSKARS AND THE INFORMATION FROM THE REPRESENTATIVES. – IT IS NOT FAIR TO HELP THOSE WHO TELL LIES TO THE TOURISTS EVERY YEAR !!! – YOU DECIDE FOR YOURSELF!!! ADVICE to some middlemen, some Greek travel agent and some representatives on Kefalonia! STOP the war against Oskars and after I stop giving advertise leaflets to the tourists. STOP telling stupidities and nonsense about Oskars to the tourists for 25 minutes at the welcome meeting! STOP trying to confuse the tourists, by asking them not to visit Oskars restaurant, because we refused to pay you commission. NO-ONE should let them think that they are more clever than you and your family, because they continue to say the same stupidities and nonsense to the next tourists just to sabotage us. 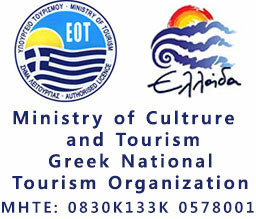 For your own business you are advertising about the excursions, car hire, Myrtos sunset, by night Fiscardo etc. and of course with exp………… prices. KEFALONIA is a big and very beautiful island with plenty sightseeing and beaches in Lassi and also all around Kefalonia. GIVE information to the Tourists about those things so they will have better holidays and not just what is for your own interest. STOP the talk talk, bla bla bla and the war against Oskars. STOP because your clients understand all about you. MANY of them they make fun of you and they are saying to us all about you. RESPECT the tourist because you make a living out of their money. 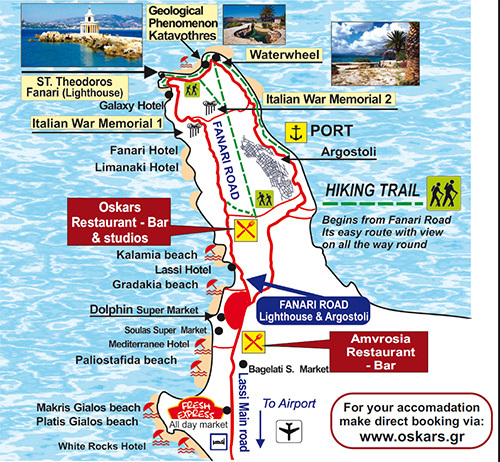 START the information about kefalonia for 50’ minutes and 2’ minutes about Oskars. START making good information for the clever Tourist people. WE love the good representatives’ who is not telling stupidities to the tourists. Don’t forget to have lunch at a traditional tavern and taste “aliada”, “kreatopita”, “rombola wine”, and many other local delicasies. If you love sports, you can enjoy a tennis game at the municipal tennis courts or visit the riding school of Lourdas and have an unforgettable experience. If you have a passion for hunting visit the Kefalonian hunting club. Watch the sunset from the top of Ainos Mountain, one of the highest mountains in Western Greece. If you wish to explore the natural beauties of Kefalonia, you will need to hire a car. If like to sail you will love Kefalonia’s numerous unspoiled impassable by land beaches. Experience the biggest local celebration of St. Gerassimos the 15th and 16th of August where the island overflows of visitors. Seek for the Kefalonian serenades (folk music) in lithostroto street, Argostoli or any other city. Perhaps you have read the book, or seen the film, “Captain Corelli’s Mandolin”. If you wish to see the places where the film was made you need to have a good memory because very little remains to see. Most of the filming took place in, or near, Sami and Agia Efimia. The front of Sami became the Argostoli waterfront and the area around the hotel Kastro was transformed, the present building all hidden behind the film set. If you look closely, in the road you will see a line of cut-outs where explosives were placed. From Sami find the road, near to the port office and take the smaller coast road to Anti-Sami. After the town area, on the left overlooking the sea, is the house where Nicholas Cage stayed. The high point on the road, where the land juts out towards the sea is called Dikalia. Here is where Dr. Yiannis village was constructed, by the road and where the earth road goes towards the sea. No digging was allowed, the area being protected archaeological site. Further along this road you come to the bay and beach of Anti-Sami. In the fields behind the beach was created the Italian army camp with gun emplacements by the road side. Before the filming this bay was quiet, without beds, umbrellas and fences. Retrace your steps up the hill and take the road to the left signed Moni Agrillion and Agia Fanendes. The view from the monastery overlooking the sea, Ithaca and Anti-Sami is worth the visit in itself, however, visit the little monastery through the gate and soak up the peace. Further on is Fanendes with its church and ruins from earlier times. As you approach, up on the left, is the threshing circle seen at the beginning of the film and the church at the end. Among the trees, slightly lower and to the left, is the ruined church from the earthquake of Agios Nikolas overlooking, from high up, Sami. From Sami and after Agia Efimia, where the crew and cast also stayed, take the east coast road towards Fiskardo to find the site of, Mandras’s beach, shown on the books front cover, after the film was made, at Komitata take the first road to the right leading down to the sea. The road leads to Horgota Bay and Agia Sofia. Horgata was where the fishing boat jetty was constructed, first seen when Mandras threw Pelagia into the sea. The jetty remained after the filming finished, but its upkeep has not been maintained. On the west coast is the famous bay of Myrtos here were filmed the beach scenes, the prostitute’s picnic and Corelli’s attempt to blow up the mine. On the southern slopes is Moni Sia which can be reached down an unmade road – beautiful in spring with the wild flowers. If you wish to visit, look carefully for the sign from the main road. Here were filmed the love scenes between Corelli and Pelagia. Much of the book relates the struggles between the Germans and Italians. Very interesting, regarding these events, is the small museum, dedicated to the Italians located at the side of the Catholic Church on Lithostrato in Argostoli. Also you can visit the Italian War Memorial above the Theodorus lighthouse at Fanari. This area had particular significance and holds many memories for those involved in the history of this eventful time.